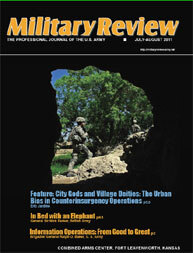 Description: Military Review is printed bi-monthly in English, Spanish, and Portuguese, and quarterly in Arabic. Approximately 12,000 copies of the various editions are distributed in more than 100 countries. Military Review is widely quoted and reprinted in other publications throughout the world and is readily available for reference at research agencies, civilian university libraries, most military libraries in the US and abroad, and electronically via the World Wide Web. Military Review provides a forum for the open exchange of ideas about military matters of importance to the U.S. Army with a focus on the concepts, doctrine, and warfighting at the tactical and operational levels of war. Military Review supports the education, training, and development of doctrine and the integration missions of the Combined Arms Center (CAC) and the Command and General Staff College (CGSC) of the U.S. Army.